The naturalistic camerawork, gritty urban environments, or brutal setting of mixed-martial-arts fighting may mislead viewers away from the truth: Gavin O’Connor’s Warrior is a man-weepie of the highest Hollywood order, a would-be Rocky for an empire in decline. 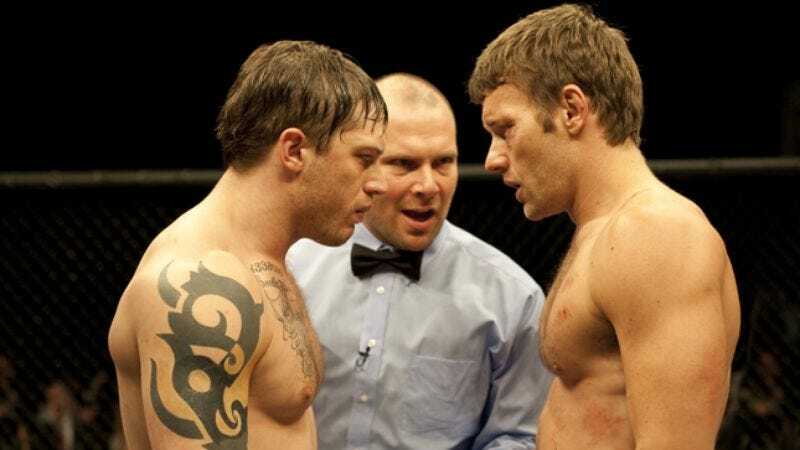 It’s irresistible, but how could people resist when Warrior comes packing double-barreled underdog arcs in the form of brothers played by Tom Hardy and Joel Edgerton? They’re estranged from each other, but not as much as they’re estranged from their alcoholic father (Nick Nolte), who terrorized them and their mother until she ran away with her younger son, prompting her husband to eventually get sober. Hardy is a distraught former Marine who washes up on his dad’s Pittsburgh doorstep and starts training at the local MMA gym, beating the consciousness out of what turns out to be a highly ranked fighter in what was meant to be a casual sparring match. Edgerton is a Philly physics teacher and family man struggling to pay the bills, a former UFC pro who moonlights in parking-lot matches for extra cash to throw an upside-down mortgage. These two archetypes of bruised American masculinity are played by a Brit and an Australian, and played well—particularly in the case of Hardy, who’s been poised for stardom since 2009’s Bronson. He’s riveting here, a little boy lost with the hulking build of a minotaur; his dialogue would scarcely fill a few pages, but his character speaks volumes with his fists. According to every rule of the movies, these two are destined to grapple out their resentments in the cage, and each ends up as an unlikely entrant in Sparta, a nationally televised tournament arranged by a former finance hotshot who puts up a $5 million prize to determine “the toughest man on the planet.” (That isn’t the only slightly creaky classical reference—as a high-school wrestler, young Tom wanted to beat the undefeated record of ancient Greek fighter Theogenes.) Warrior is unapologetic about the violence of MMA; Sparta takes up the second half of the generous runtime, and its bouts are as vicious as they are exciting, though they’d be better served by a camera that sat still long enough for them to develop. But for all its titular bravado, Warrior never lets the audience forget the economic and spiritual desperation driving its two main characters, who bleed for the screaming arena crowd in exchange for their shots at redemption, and offer a rare glimpse of soul in a type of film that usually isn’t obliged to provide one.